We have a part we call the Segment. It is one part of an assembly we provide for use in a medical diagnostic instrument used in a variety of hospital settings. It is made of MIC-6 Aluminum Plate and is one of the higher cost components in the assembly. Tier ONE was set a goal to reduce the overall cost of this component for a new instrument by 30%, in order to match offshore costs while still providing onshore quality, delivery and responsiveness. 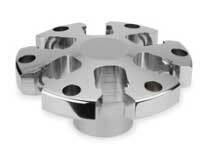 The part in question was previously manufactured on a 3-axis vertical machining center in 3 operations with a total cycle time of 160 minutes per part. We knew Tier ONE’s quality and delivery performance was unmatched, but we had to have the savings as well in order for the product line to survive in a very competitive market place. Tier ONE chose Mazak to partner with using their Teamkey Engineering approach, which allowed us to co-develop the programming, process, and tooling for use on one of two new Mazak HCN-5000s with a 24-pallet Hi-Rise Palletech system and a 330 Tool Hive. We utilized 2-sided tombstones on each pallet, and thanks to the multi pallet system we were able to leave the fixtures setup all the time thereby completely eliminating set-up time. This solution allowed us to use only two operations to make this part. The total cycle time is now 19 minutes each…an 82% reduction, allowing us to achieve the targeted 30% assembly savings. Another benefit of this approach was that we integrated the two different segment configurations into a single plate, which allowed parts for one assembly to be completed in one machining cycle. This provides the capability for single piece flow. Minimally it enables batch size reduction in line with downstream secondary process, reducing cycle time. Another Lean technique for mill turn would be moving a part from conventional multi Op turning and milling to single turn Op – reducing setup, total cycle time, inspection, batch sizes and inventory, while improving quality by reducing workholdings/common datums.